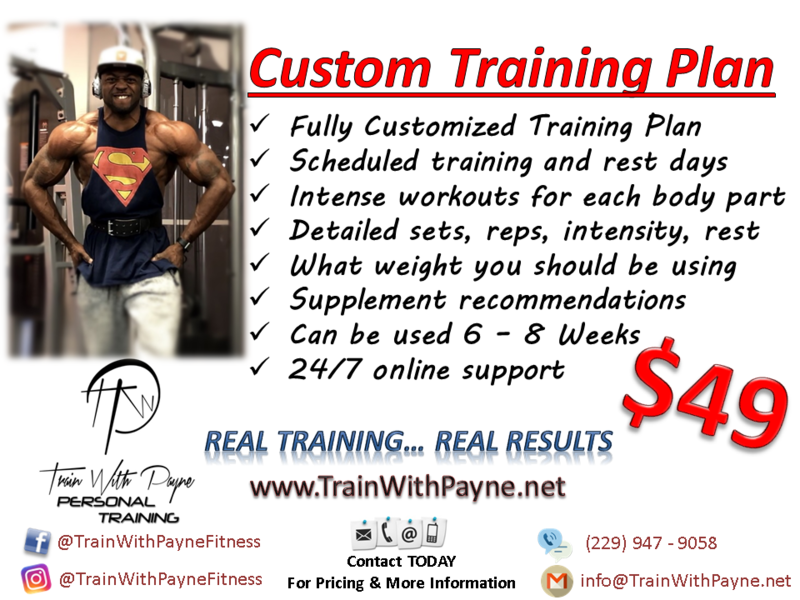 You can choose to Train With Payne online OR 1 on 1 personally! All 1 on 1 training sessions are booked for 1 hour and are held at Destiny Fitness Gym in Cordele, GA. 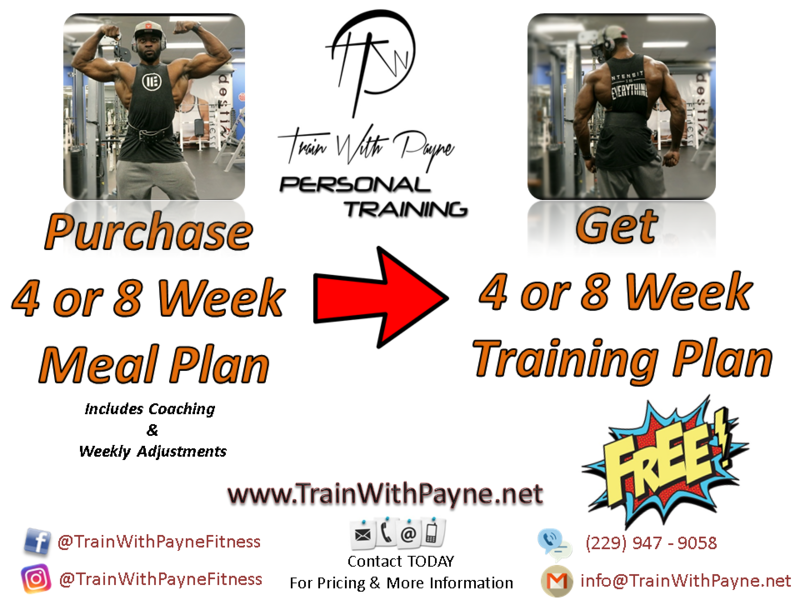 If you're serious about getting in shape, and taking your fitness to the next level, then start your Train With Payne program TODAY! Online personal training will allow you to have all the benefits of face-to-face training without the hassle of scheduling conflicts, inconvenience, and price tag! Having an online trainer gives you the convenience to complete your workouts on your own time, either at home, at the gym, or in any space you so desire. Communication is the key to your success. You'll still be able to be heard and have all of your questions answered through email, text, telephone, video chat, and social media! Also, the costs for online training versus traditional face-to-face training are significantly lower, allowing you to get more bang for your hard earned bucks! No matter your goals, or fitness level, your plan is customized to fit your individual needs. 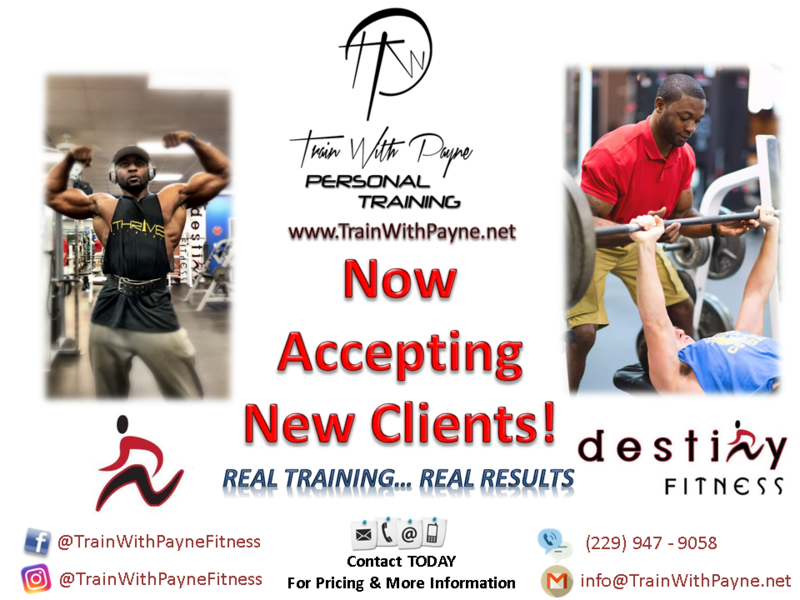 Train With Payne offers programs for strength and muscle building, weight loss, cardio, as well as diet and nutritional plans. Train With Payne also offers body part specific workouts for those looking to bring up lagging body parts. Whether you're an avid gym goer, or new to fitness, there's a plan just for you! Whether your goal is muscle building and/or weight loss, resistance training is key in helping you to reach your goals. Each program is designed with strength and cardio training catered to YOUR individual needs to effectively deliver the RESULTS you deserve! The key to achieving your ideal physique lies in your diet. Quality in will always equal quality out. There's no "one size fits all" when it comes to nutrition and supplementation, that's why we consider all of your individual factors to develop a nutritional plan that works for YOU! Are you looking for explosive workouts geared towards developing a specific body part? We have an archive of workouts specifically designed to help you target your trouble areas and bring them up to par!